Look for our beautiful, classic turn of the nineteenth century two-story red brick building on the Northeast corner of Cedar and Riverside Avenues – very close to the Metrodome, University of Minnesota, West Bank and the seven corners intersection. We are less than one block from West Bank Station on the Green Line. During the Expo the free validated parking behind our store is only partially available, due to presence of expo tents. We recommend nearby U of M parking ramps or lots. They offer all-day rates starting at 5:00p.m. on Friday and all-day Saturday and Sunday. The 7 Corners ramp is also a good option. 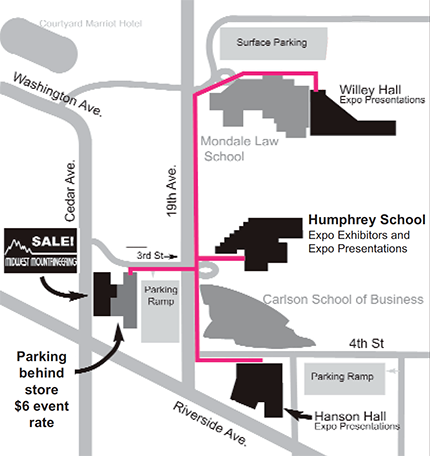 During Winter Expo the parking lot behind our store is available ($6.00 daily flat-rate). We also recommend the U of M parking ramps and lots. They offer all-day rates starting at 5:00p.m. on Friday and all-day Saturday and Sunday. The 7 Corners Courtyard Hotel ramp is also a good option. Coming from downtown Minneapolis or Saint Paul, the Airport, or Mall of America? Trains run at least every 15 minutes! Central Corridor (Green) Line: (metrotransit.org/metro-green-line). 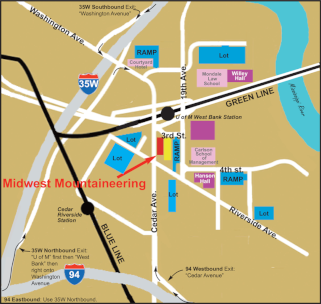 We are excited to be located less than one block from the Green Line's West Bank Station. Green Line schedule. Hiawatha (Blue) Line: (metrotransit.org/metro-blue-line). 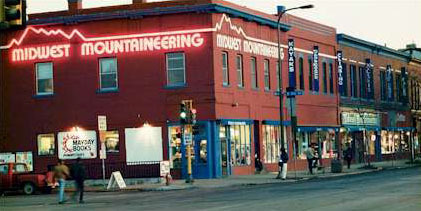 Riverside Station is three blocks from Midwest Mountaineering. Did I mention it's easy to find? Just continue Westbound on Riverside Ave past Cedar Ave and follow the road to the left as Riverside becomes 15th Ave South, go two blocks. Blue Line schedule. Make it convenient – Purchase a Go To Card for easy riding on all buses and trains, and get a 10% discount (Click image at right). Hop a bus – many routes go right past Midwest Mountaineering! Use Metro Transit's handy-dandy interactive Trip Planner to get route information - directly from your door to ours! Easily ride from the store (West Bank) to the East Bank (5 minutes) and Saint Paul (20 minutes) campuses! Catch these frequent-running buses one block from our door (next to Willey Hall on the westbound Washington Ave exit). View the campus connector shuttle bus map & schedule to see how easy it is! P.S. You don't need to be a university student to ride these free shuttle buses! Easily ride to the store on many trails including Mississippi River Roads (East and West), Hiawatha Avenue, Midtown Greenway, and numerous U of MN bicycle lanes including the 19th/10th Avenue, Dinkytown Bikeway Connection, and Washington Avenue Bridges. All buses and trains can carry your bike, too. Park your bike on the North side of the building - next to The Hub Bike Coop. Additional bike parking (100 plus spaces) is available on the mall between the Humphrey Center and Wilson Library. Cost: FREE + Fresh Air & Exercise.